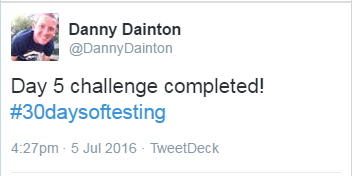 30 Days Of Testing – My completed challenges! The Ministry of Testing is amazing at getting people together and talking about Testing. From the epic TestBash Conferences and Workshops to the excellent content that can be found on the Dojo. I saw a post on Twitter that mentioned 30 Days of Testing, I was immediately intrigued – A challenge with absolutely achievable daily tasks, some of which were outside of my current comfort zone, it was right up my street!! I entered this Challenge knowing that I wouldn’t actually be able to finish it in 30 Days, not because I would have serious trouble doing any of the tasks but because my Wife is due to give birth to our Daughter in about 2 weeks…so I’m just trying to stick with it for as long as I can until I’m facing another new challenge!! 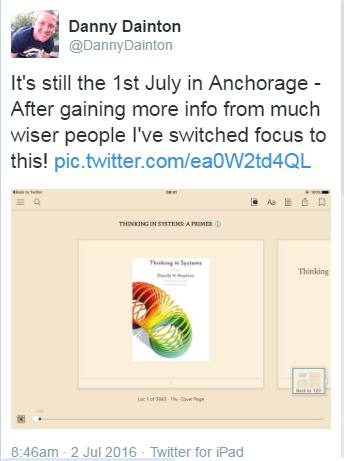 Day 1 – Buy one testing related book and read it by day 30. So this was a tricky one for me – There are several amazing books out there that people have recommended on Twitter or via their talks at conferences, I’ve had a few of these on my bookshelf for a while and for several reasons/excuses I’ve not read them all yet. I’ve had “An Introduction to General System Thinking” by Gerald M. Weinberg for over a year and it’s always scared me, so I thought now was the time to step up and take the plunge. I posted a message on Twitter and straight away it dawned on me that maybe it wasn’t the best idea to tackle such a beast. After many recommendations I brought “Thinking in Systems” by Donella H. Meadows instead, hopefully, this will give me a base understanding of System Thinking so that I’m much more prepared to attack Jerry’s book. Day 2 – Take a photo of something you are doing at work. 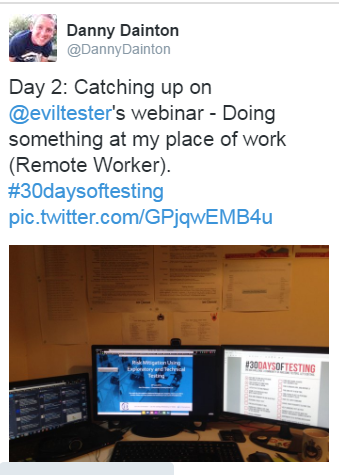 Day 3 – Listen to a testing podcast. 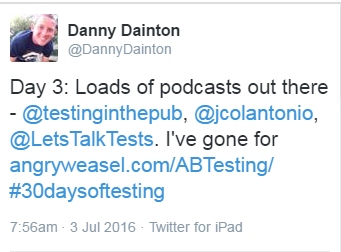 I’ve never been a frequent listener of Podcasts but I do listen to “Testing In the Pub” when the guys have a new episode out – Dan Ashby and Stephen Janaway do a fantastic job, they always have great guests and really interesting subjects. As I’d listened to the latest episode already, I looked elsewhere to complete the daily challenge. I saw Patrick Prill mention this podcast a few times so I went to check it out, it just so happens that as I was scrolling down the website I saw Patrick’s name in the description of one of the episodes – my choice was made. Alan Page and Brent Jensen were discussing Patrick’s recent TestBash talk – worth checking out both the talk and the podcast episode. There are a few other podcasts that I’ve seen mentioned by the good folks on Twitter like Test Talks, PerfBytes and Let’s talk about Tests to name a few. 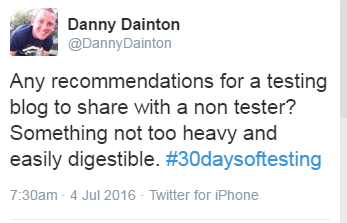 Day 4 – Share a testing blog post with a non-tester. My initial thought was to share a post with a family member (Wife, Parents, Sisters etc.) but I couldn’t quite find what I was looking for at the time, There’s some great stuff out there by Michael Bolton and Katrina Clokie that would have done the job but I opted to share a post with a member of my team instead. I shared Michael’s post “testers get out of the quality assurance business” to my team’s Scrum Master. Also, as I was in the sharing mood, I send this Whiteboard Testing video over to one of our developers – He seemed to like it so that’s a good thing! Day 5 – Read and comment on one blog post. This post by Christian Kram is the one I choose to comment on. Reading blog posts is something I’ve enjoyed doing for a number of years now. 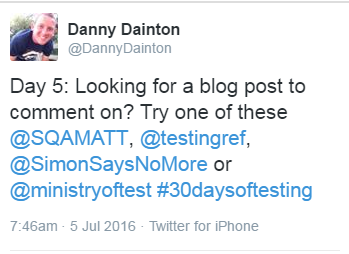 The MoT testing feeds site was the first place I was made aware of testing blogs and from there Twitter has become the main source of the posts I read. People I follow always post interesting things that they have either written themselves or shared links to other people’s work. I find it very difficult to read everything I see, I make use of services like IFTTT or Pocket to capture and store posts that I can pick up when I get some spare time. I also think that these guys do a great job at sharing blog posts that people have written, they have shared out a couple of mine over the last couple of years so I’m very grateful for this. Start following these guys on Twitter if you’re not doing so already! 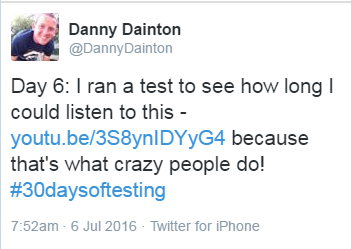 Day 6 – Perform a crazy test. What is a crazy test?! I was seriously stuck with this one and I went a non-software testing route (total cop out!). Tried listening to this for as long as I could – Put it this way, it wasn’t the full 10 Hours!! 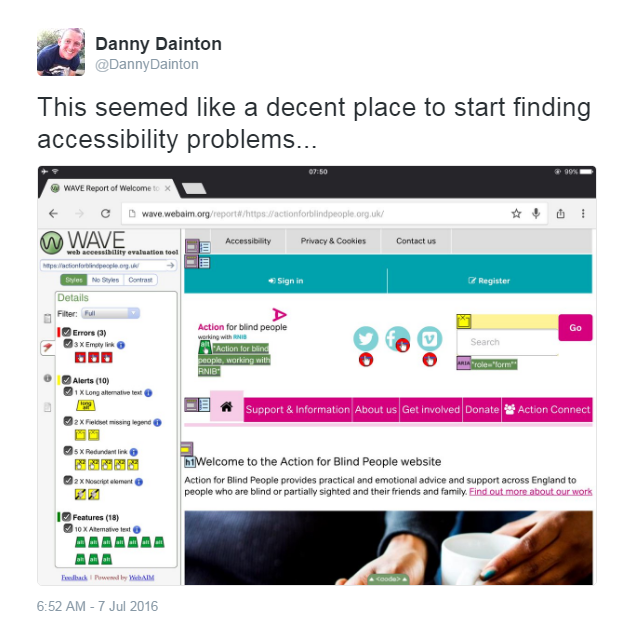 Day 7 – Find an accessibility bug. This has been an area of testing that I have struggled with over the last few years, I’ve always focused my efforts in other areas so this was a great opportunity to learn something new. As with most tools, this uncovered areas of the site that had accessibility problems but this is just an invitation to investigate and explore the site further. Maybe using other similar tools, that highlight these issues, ensuring that the tool that you have chosen to use is giving you the correct information. Screen Readers are another great way of backing up some of the issues that the accessibility checkers have brought to your attention – I really like pairing up tools this way as they tend to compliment each other really well. Day 8 – Download a mobile app, find 5 bugs and send the feedback to the creator. I was looking on the App Store for an application that I could test – I didn’t really have a preference in mind. 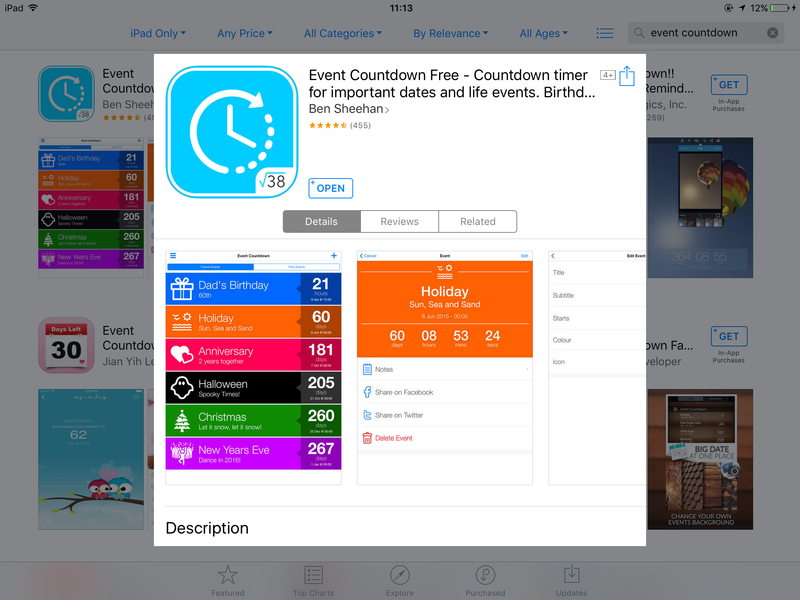 I came across “Event Countdown Free” – It had 4 stars and over 450 reviews but as it dealt with timed events, I thought it was worth checking out and seeing what I could find. I created a report of what I found so that I could send it off to the Developer but I’ve haven’t been able to get in touch with them yet. The Developer website in the description on the App Store links to a Facebook page and as I’m not a user of that site I cannot leave any messages there. These are the rushed details of my testing that I prepared – I made them available in a Google Doc with the intention of hopefully opening up a dialog with the developer and having a shared place where, if needed, we could talk through what I found. 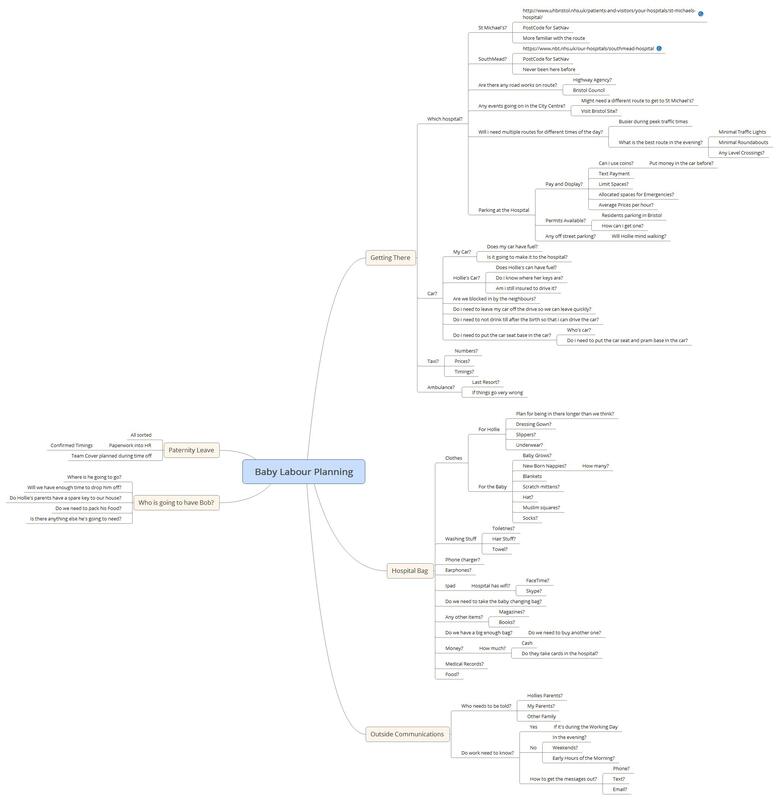 Day 9 – Create a mindmap. I was starting to do a bit of planning for the future new arrival and decided to create a mindmap about a some of the important things…still a work in progress and something that I can add to when I think of all the thousands of items I’ve missed off! Day 10 – Find an event to attend (Online or face to face). This was a great talk by Mark that I found really interesting, I took my new things away with me and I’m trying to work out how I can trickle feed some of his points into our Regression Strategy. I’m not really in the office all too often so it’s difficult to take a good picture of my team, It would probably be through a screenshot of Hangout/Skype etc. Not great so I picked an older picture instead. The whole NVM Test Team were lucky enough to attend a TestBash event a couple of years ago, sadly a few of the team have now departed but I like this picture as it was my first “trip” out with the guys a couple of months after joining the company. We have a particular process within the team that we have to go through to create/update/enabled/disabled “jobs” for a thing that kicks off a time-based task in one of our micro-services (I’m purposefully trying to be vague). Anyways, it’s manually done through a database query and I didn’t like that so I attempted to give it a UI (very bootstrap but it was just what i needed) that we can use in our local dev environments. This is the actual site that i knocked together (Changed the labels etc.) written in node.js using the Express.js module to create a web server and I added the UI using a rendering module called Jade/Pug. Our devs seemed to like it and it’s now in source control. I was extremely pleased with myself! We unfortunately had the spend a few days in the hospital in the lead up to our daughter being born and that place is full of UX problems! This one intrigued me enough to have a think about it some more (These thoughts were all in my head – My wife couldn’t give a crap). Behind her bed were these 2 “buttons” without labels or instructions of use, the wire in the picture is connected to a little control pad that’s within the patient’s reach. So it turns out that 1 of the buttons resets the call to get a nurses attention for general questions, a new pillow etc. The other one is like an emergency “all hands call” button that sends every nurse on the ward running to your bed, as something serious has happened….but which one does what…. In a newer part of the hospital, I found this and the mystery was solved. I slept better that night! I honestly don’t think I’ve ever been in my “comfort zone” for the whole time I’ve been in or around testing. I don’t really like complacency and the thought of getting stale in my knowledge so I’m always finding different ways to challenge myself. When patrolling in the Army, you’re always taught to never take the path of least resistance – there’s a high chance that someone would have placed a nasty surprise there for you to walk on. So I always try and take the hard route with my learning and to not be scared of anything. All the “experts” knew nothing when they first started. Any website that displays a survey form to fill in, 2 secs after visiting the site, is a huge problem for me. Do the developers even use their own website? So annoying! I was looking on the Kiddiecare website for all things baby and like a tester, I got distracted by the functionality of the site (Any site I visit!). I was exploring the basket functionality, as you do…and noticed something that I thought was strange. Every item on their site has a max quantity value of 10, I’m sure this is to avoid people over ordering a certain product or something (I don’t know the reason, I made that up), I was thinking, what if I wanted more than 10. From here, I was able to increase the hidden max quantity value and bypass the validation. I added a ridiculous amount of bottles to my basket and was able to move further along the checkout process. I don’t know what would happen if I was able to place the order, would I get delivered that amount? Would the payment get rejected? Would I get an auto email telling me they don’t have that many in stock? I dunno but as a tester, I really want to find out. This is probably not even a problem but it was of interest to me. Well, this one speaks for itself! Little Sophie Emilia Dainton was born at 16:56 on the 16th July 2016. Very proud parents!! Winston Churchill said some absolutely inspiring things during his lifetime but I really love this Quote “Success is the ability to go from failure to failure without losing your enthusiasm”. I’ve always a massive fan of this – “If you’re not challenging yourself, you’re not changing yourself!” I tried to find the author of this but I couldn’t see it, I’ll update this page if I do, though! While in the hospital I noticed that they had free WiFi that I could use my wife’s patient details to log into too – While on the Login screen, I saw a button to “Log Out”…Huh?! Naturally, I pressed it and then I was presented with the screen in the picture above! Testing starts at home, so I thought I would explore our NVM website. I managed to find a couple of broken links on the contact page – The embedded link to the Google Maps API was causing an issue that people didn’t know about so I reported it up to the guys that maintain that site to make them aware. I’ve currently been getting to grips with Visual Studio Code it’s a newish open source text editor from Microsoft, we have been using node.js recently within my team and this editor lends itself perfectly to that. I’m a huge fan of Sublime Text but this editor is becoming very useful with its build in features and it’s being updated all the time by the community – Worth checking out! We are lucky enough at NVM to have some very talented security testing specialists that were kind enough to package up a modified image of a Kali Linux instance for us to install onto a Virtual Machine (VirtualBox). This provides us with a safe environment to practice some of the different security testing techniques and approaches. The Kali toolset it very good and there are tons of tools in there that I’ve never heard of, so it’s interesting exploring them to discover how I use them to aim my security testing during the development of new NVM features. I was on paternity leave at this point so I wasn’t officially “working”….however, I was still monitoring our team’s chat room (Shhh, don’t tell my wife) and one of the devs had a problem with access to an environment that I knew I could help solve. I took the conversation to a 1 to 1 room and we paired up to get him access to the area he needed. I think everyone’s brain is their best test tool, well it is for me at least but I also really like a tool called LICEcap. It allows me to create short .gifs that I attach to bug reports etc. It really brings the words to life. There are many tools that do the same thing but this is my goto tool if I need to create something quickly. Testbash is something that I hold very dear to my heart, it was the first conference that I attended and it just firmly cemented, in my mind, that testing was what I wanted to do and from there that point, it’s been my main focus in my life! Testbash has expanded since that point and Manchester has been added to the list of locations – Richard Bradshaw is the guy running this one and if he’s involved, you know it’s going to be epic!! So I brought my ticket as soon as I could – Due to lots of different events, the birth of my daughter being one of them, I decided that leaving my wife for a couple of days to look after Sophie on her own just wasn’t fair. It would have been easy to just get the money back but I wanted someone else to go in my place and experience the buzz of TestBash. Patrick Prill was the lucky guy! This bloke is one of the nicest people I’ve met and I couldn’t think of a better person to go in my place. 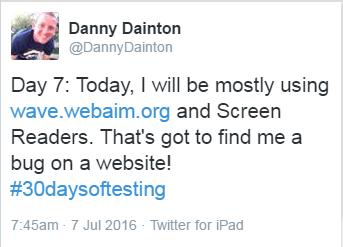 Looking forward to hearing about his time there and what he learnt to help him test better. I put this out there as an open offer really – I love talking to people and if anyone wants to have a chat something then please just drop me a message. I try and do this as much as I can, on the different media channels that I subscribe too, for a long time I’ve been a passive observer but I’ve tried to offer something more now that I have gained more testing experience. Lots more work to be done in that area! I share stuff all the time at work in our public chats rooms with the view that someone from NVM, who is not a “tester”, will attend an event. I’ve not been great at directly inviting people to events so that’s something I’ll need to change. I’m always saying nice things about the things I test, I don’t see the point in starting out with a negative mindset (Sometimes that’s needed based on a certain persona). For me, there’re positives in everything that we do. Do I need to explain this one more…. This is something that really bugged me and is perfect for my out by one error. In this photo the children are making the shapes of letters, to spell the word “Healthy” which is fine but in the top left corner there is a circular shaped object that has the word “Healhy” – missing the letter “t”…It’s the small details that count. The team of guys I work with at NVM are truly amazing!! I’ve learnt so much in the time I’ve been there – these people are super talented!! So that’s the challenge completed! Hopefully, you enjoyed reading about how I got on during the month. Previous Previous post: A small step back in time!